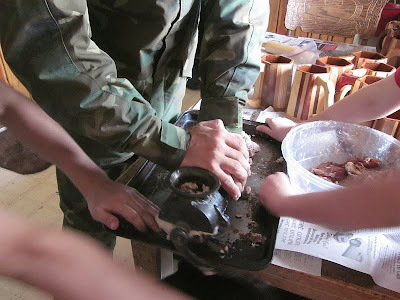 Last year at a local antique store, we purchased a weird-looking meat grinder thingy. It's made of cast iron and very heavy. Anyway this week we ran out of the bacon bits I'd canned up earlier. So I purchased several packs of bacon ends to cut up, fry down, and can. It's the cutting up part that's a pain. So -- why not try the grinder? We quickly discovered a couple of things. One, if we're going to use this grinder on a regular basis, we'll have to mount it on something. Trying to crank it while holding it down was tough. Two, the blades are dull. No surprise, considering its age. Make a note, sharpen the blades. Three, don't overstuff. The more meat being processed through, the harder it is to crank. Feeding it at a moderate pace works better. But it worked just great! The meat was ground so fine I wasn't sure how it would fry up into bacon bits. So we ground just one package and tried frying it up first. 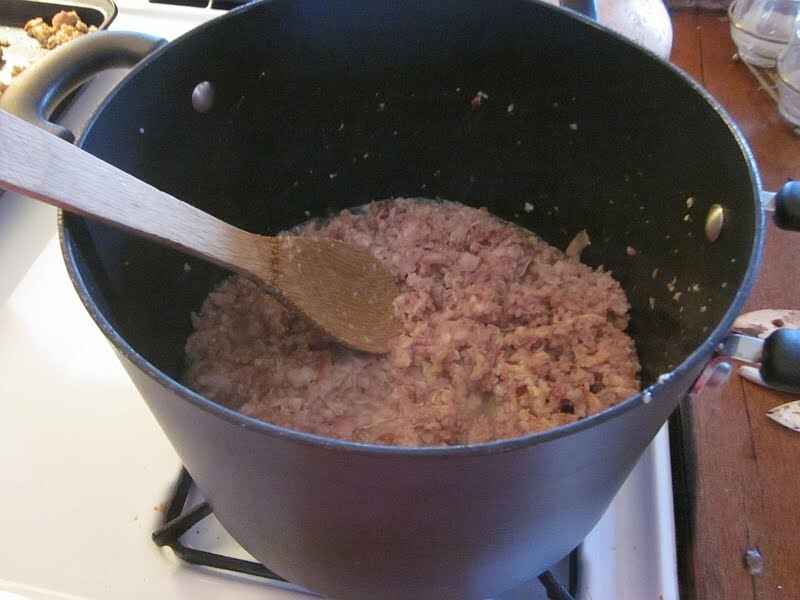 ...so we went ahead and ground up the rest of the meat. Here are some neighbor kids joining in the fun. Many hands make light work! When all the meat was ground, I opened the grinder to remove the stuff still caught in the blades. It wasn't hard, and only took a few minutes. Ah, now cleaning it... that was a different story. What a hassle. 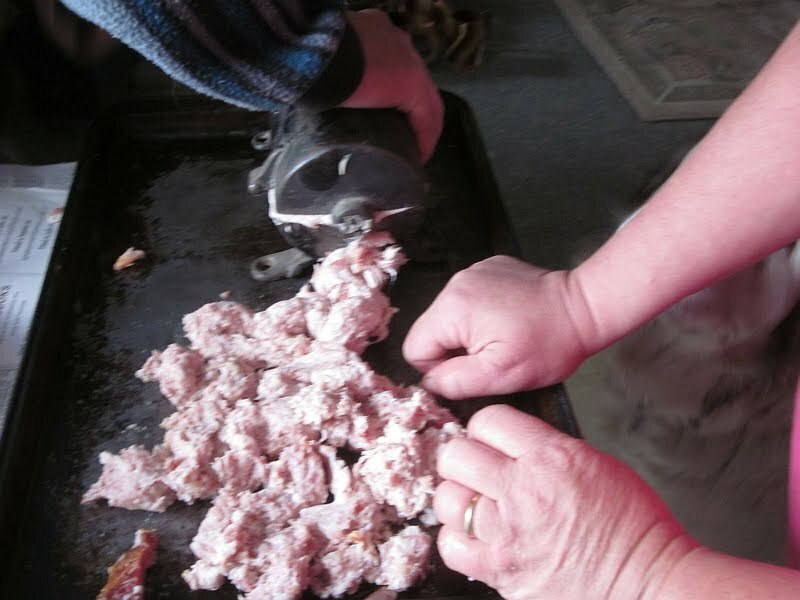 Make another note, only use the grinder when there's a lot of meat to grind. 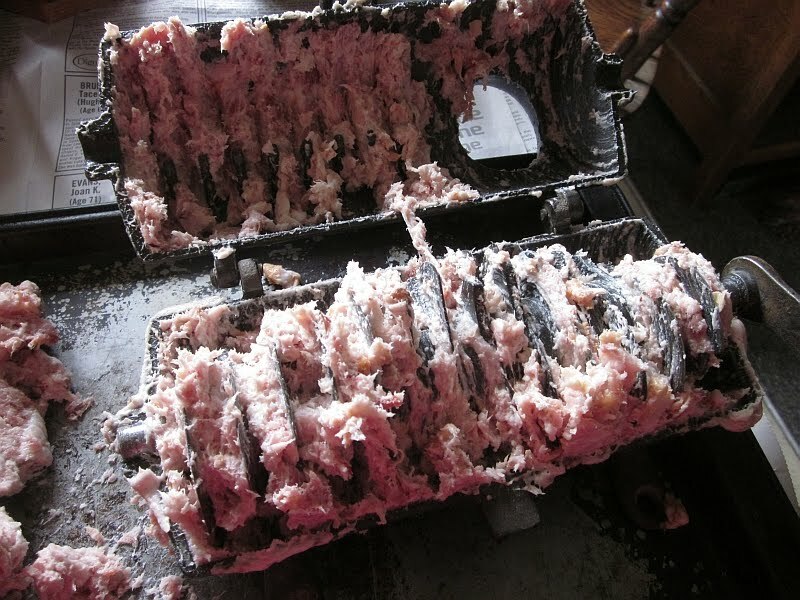 Otherwise the cleanup procedure isn't worth the effort. Fortunately the blades can all be removed, but it still means that each part must be scrubbed separately. Despite the hassle of cleaning (which, frankly, would be inescapable even with a new meat grinder), I'm more than pleased with how this antique performed. I think it's a valuable thing to start collecting hand tools of assorted varieties, both shop tools and kitchen tools. 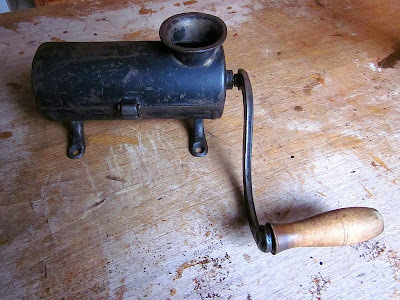 This antique grinder now has an honored place in our pantry. 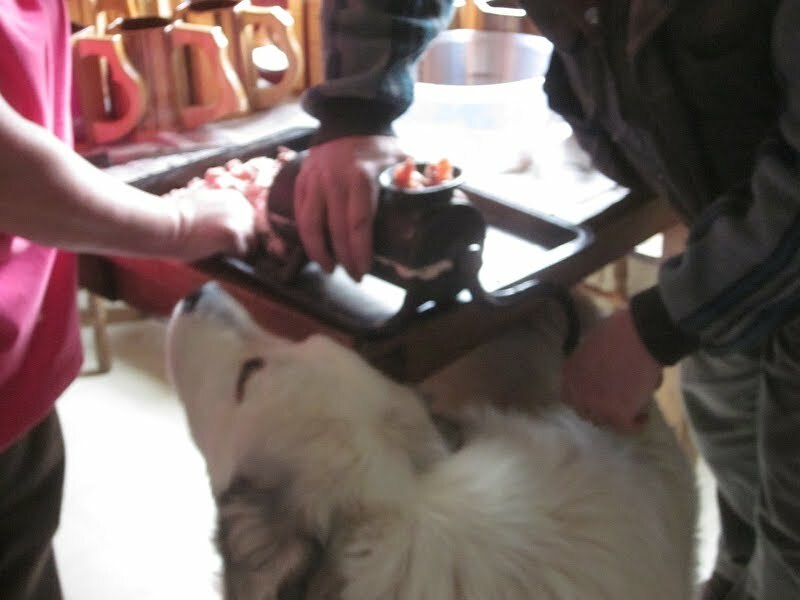 Hi,Patrice, Your grinder can double as a cuber by opening it to lay a piece of boneless meat about 1/4" thick on the blades, close and turn the crank once then rotate the meat 180 degrees and turn once. You may have to play with it to get the exact formula for good cube steak (or pork or chicken cutlets).A butcher friend told me about this and it works pretty good. Now you have gotten my interest. I love bacon, I admit it's a weakness I have and have passed it down to our sons. Hehehe. Anyway, I am curious how you can/store the bits. I have never even attempted that and would love to make our own since we stopped eating them due to eating healthier meats and no one you buy meat from makes bits. Could you share your process? On the left hand side of the blog is a key word search. Look for "bacon" and click on it. It will give you three blogs that Patrice has done on bacon. 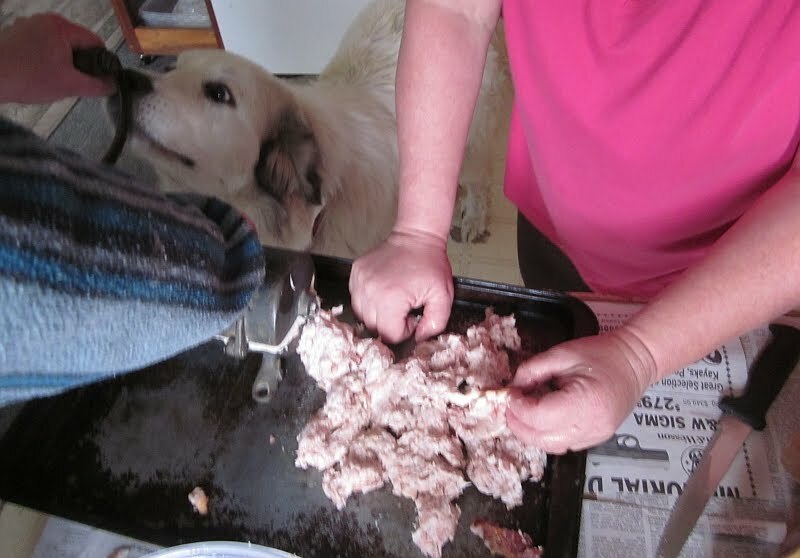 One of those gives her bacon bit canning procedure in detail. I have used it, and it is wonderful. I love old stuff and this post is great! I think the country has fell into a new way of life where everything comes from Wal-Mart and last for a year if you are lucky. If you pay $5 for a toaster it will work like a $5 toaster. I remember when my dad passed away in 1983 my Mom still had a Sunbeam four slice toaster they got has a wedding gift in 1969. My mother gave it to my sister and it worked great for her till the late 1990's, that toaster lasted for almost 30 years. I look for old tools and stuff all the time because it was built better and will out last the new junk they make today. Thanks for a great post! Alton Brown talked about cleaning grinders on an episode of "Good Eats". 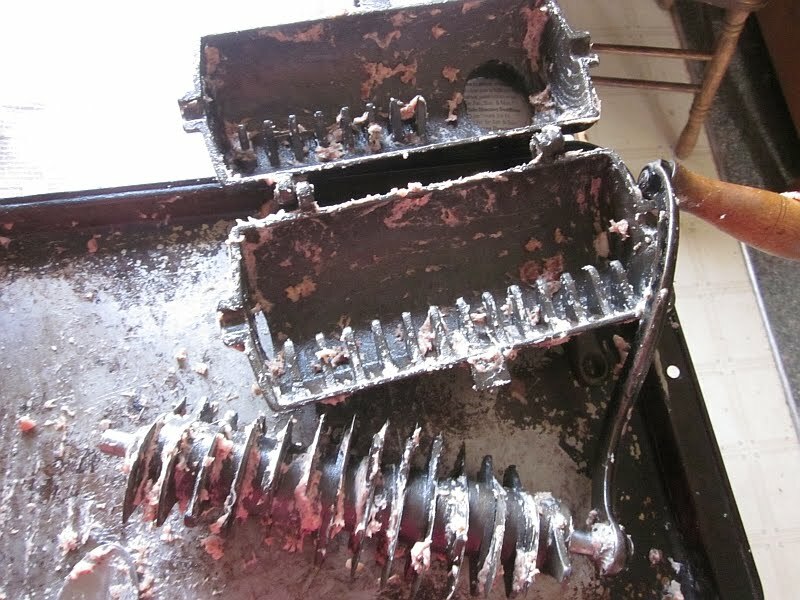 He said manufacturers should include cleaning instructions as well as operating instructions! He said the best way to clean a grinder is to run a few pieces of bread through it. 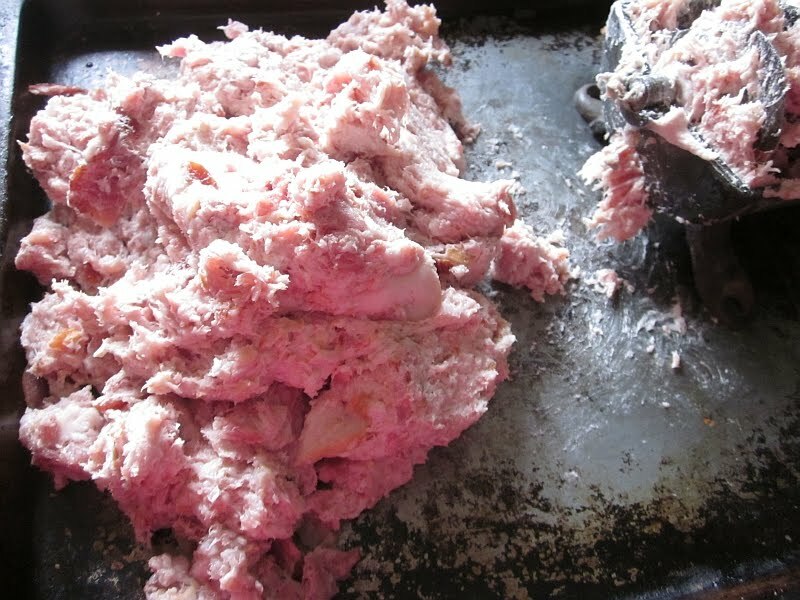 The bread picks up the meat and much of the fat so you have less to clean up. I tried it recently with my kitchen aid grinder and it worked beautifully. I have not tried it with my hand grinder yet. But I can't see why it wouldn't do the same. Did you oil your parts? It will go a long way toward preventing future rust. I love my old grinder too, and I seasoned all the parts like my cast iron cookwear. It didn't affect the performance, everything still fits together. I didn't season the threaded parts, I just oiled them before I put it away. I was told of your blog last August 2011 and I have enjoyed all post since that day. Love all the info on food prep, THANK YOU. Do you think Don has any of his tankards for sale right now? Saw several in the pictures of the bacon grinding, and my Honey would be very delighted to have one for Fathers Day. I guess I should come out of the LURKER MODe, hunn. Geezermom wrote you some good advice. 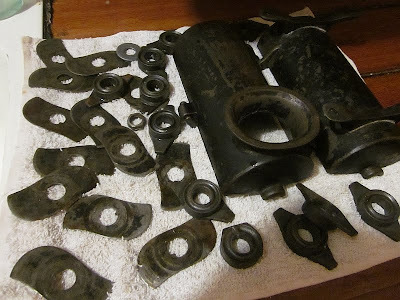 Keep a little oil on the parts for storage to prevent it getting rusty again. 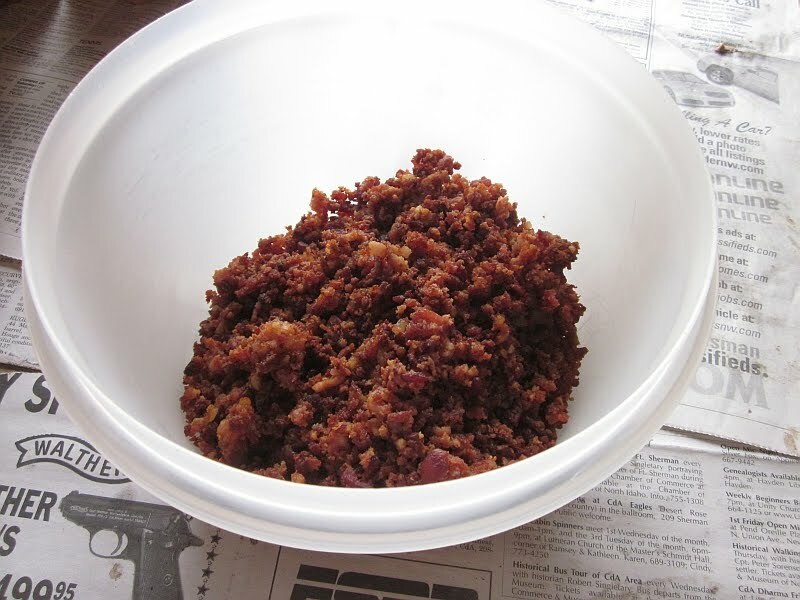 Also run a little vegetable oil through it before the meat next time you use it, the whole process will work better. Please don't let anybody wire-wheel any more iron treasures, though. :) Please. There are much better ways to clean iron. I love old pieces like this, what a lot of parts, I would have to agree about waiting till you have lots of meat to process. My grandma had one like that only it was silver and clamped to the table. We used it to make homemade chicken salad. lol, i am the proud owner and user of every gadget that was used in a non electric kitchen and still collecting odds and ends now and then.. the one thing i do not have is a meat grinder though-gonna start looking around for one. 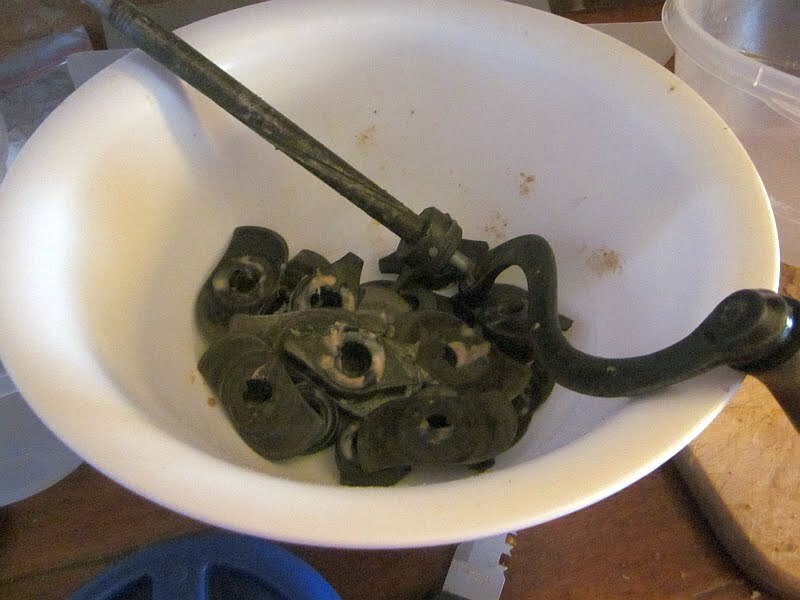 i like using these obsolete pieces because you dont have to be in a hot kitchen to use them.. and of course, they obviously last a really long time. and are fairly simple to use too...dont need a book of instructions written in chinese either! i really liked what that grinder did for your bacon bits. I've not seen a grinder like that, but it looks like it did a great job. well, hey, how do YOU season your iron? I have an old hand crank one that clamps to the counter top. :) I don't think it has all the parts it came with, but I keep my eyes open for them at yard sales and swap meets. I'm sure I'll eventually find them. :) I found a smaller one that looks like it, and the folks I got it from said they think it's a nut grinder. Whatever it is, I like it. I collect weird, hand operated tools of any kind. My collection isn't huge (yet), but it's fun to collect (amass/horde) useful, old things. I fairly certain what you have is a tobacco leaf shredder. I agree. Meat grinders don't work that way. 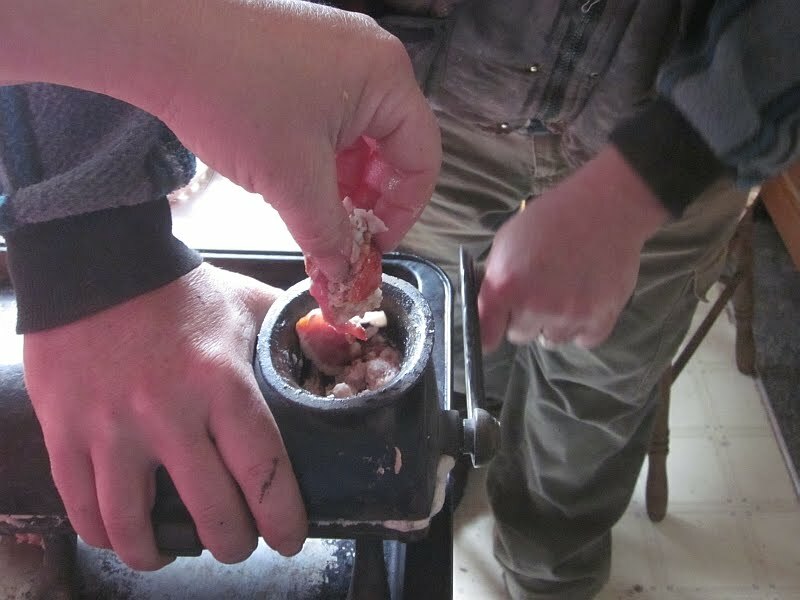 I know this is a very late comment but what you have is a tobacco grinder not a meat grinder. I am an antique dealer and see these quite often in the south. Just thought you'd like to know. Cool beans! Thanks for letting us know. yup, it's for tabbaco....but good to know what it will do to meat! The old tobacco grinders have a lot of uses. 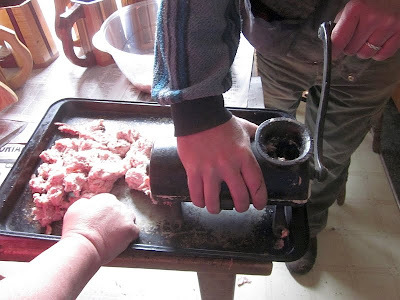 Where I grew up in Pennsylvania (the section of the Appalachians settled by Germans (PA Dutch), they were called Potato grinders because they were used to grind up potatoes (and onions) to the perfect size for making "Potato Sausage." Potato Sausage is an old PA German / Dutch food made with ground potatoes, onions, pork, salt, and pepper stuffed into sausage casings. There is a lot more potato than pork so it was a good way to make meet stretch. 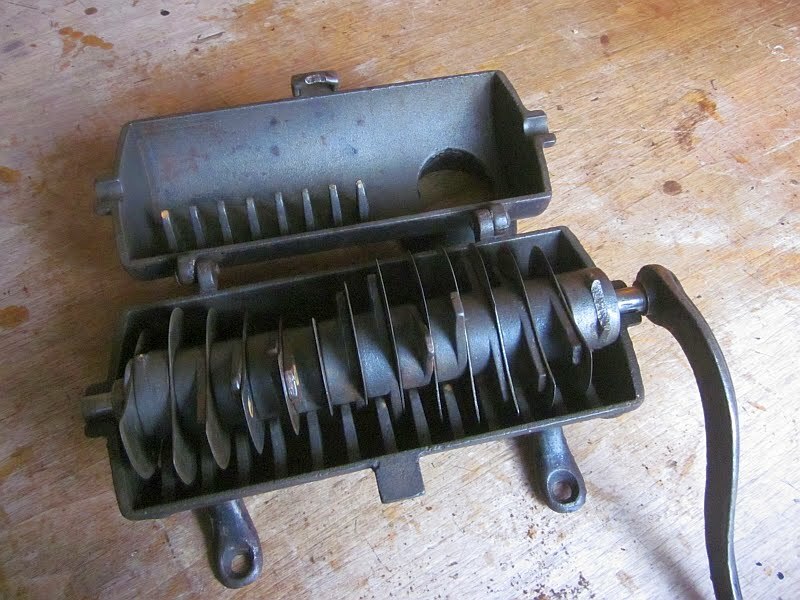 These old grinders grind the potatoes and onions to the perfect size for this dish. I never knew they were supposed to be tobacco shredders until recently. This I beleive is a meat chopper not a tobacco grinder. I didn't know there was an attachment for grinding meat. Add that to the Christmas list... Thanks for the tips! Many of these now antique grinders were multi-functional machines making them that much more valuable to the original owners. Just learned what I have called an apple cider mill for the past 25 years is also a sausage stuffer! Haven't tried it for sausage yet but works well for squeezing out apple juice. I have a grinder similar to yours that I also call a sausage grinder. Just now learning it could be used for shredding tobacco. Aren't antiques wonderful! Nice you collection.I din not seen this type of machine yet. My grandparents had one of these, i still have it now, its really useful ! Great collection. Though I seen it many many years ago in my grandmother's house. It looks really gorgeous. Where can I get one of those grinders? No clue, sorry. This one was just a lucky find in an antique store. That makes sense! I believe you're right. Though, as my husband wonders, how it ended up out here is anyone's guess. Thank you!